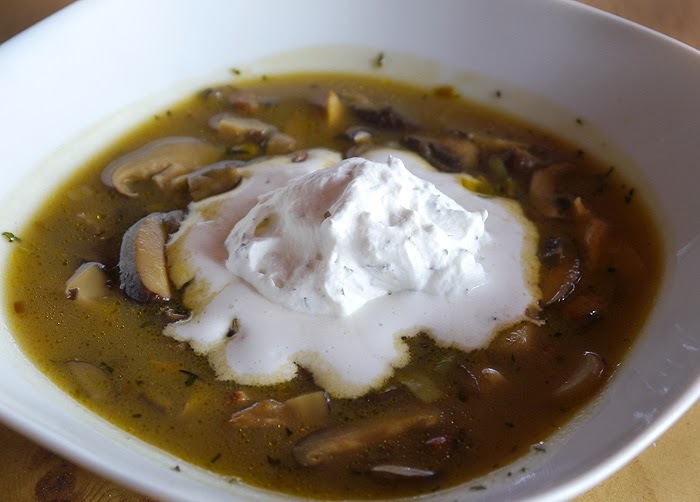 Just before the holidays I had the most amazing mushroom soup at a restaurant here in Phoenix. I tried on several occasions to garner the recipe from the chef but he just wasn't sharing. So I was left to come up with a recipe of my own. I gathered from the menu description that along with mushrooms the other dominate ingredient was leeks and that it was laced with cream. I did some additional research and found an article that mentioned the types of mushrooms the chef used....so I had a pretty good idea where I was headed when I got into the kitchen. My local Whole Foods Market has a great variety of mushrooms both fresh and dried. In the recipe below I used dried morels, lobster and porcini along with fresh cremini & shitake. Both the texture and taste of this combination was a hit. Though it's more traditional to mix the cream into the soup I was really happy with floating it on top; a method I had seen on epicurious. Using electric mixer, beat cream just until soft peaks form. Fold in 1 teaspoon thyme. Cover and refrigerate at least 2 hours to blend flavors. Remove from refrigerator 1 hour before serving to come to room temperature. In 4-quart stock pot over moderately high heat, heat 2 tablespoons butter until hot but not smoking. cook mushrooms, stirring occasionally, until lightly browned, about 8 minutes. Transfer to large bowl. In same stock pot over moderate heat, heat remaining 1tablespoon butter. Stir in leeks, cover, and cook, stirring often, until soft, about 5 minutes. Add cooked mushrooms, sprinkle with flour, and stir until flour is evenly distributed. Stir in stock, then salt, pepper, and remaining 1 teaspoon thyme. Bring to boil, stirring often, then reduce heat to low, set lid ajar, and simmer 20 minutes. Divide soup among 4 bowls and float a dollop of thyme cream on top. Serve immediately. oooh, leeks with mushrooms, sounds soo good! The dollop of thyme cream puts it over the top. I’m going to make this soup!! It’s pretty good and you can try Mushroom in a savory setting. I love this concept ~ sounds amazing! This sounds like such a delicious flavor combination! I love mushrooms and thyme together.....sounds amazing!! This is a fabulous recipe. Can I mention it in a children's recipe column with due credit? It's a great way to get kids to enjoy vegetables!